Makeup, meals, books, razors, clothes, dog toys: These days, it seems everything is available for delivery via a subscription service. Not to miss out on the trend, Arby’s launched its own monthly subscription box at the beginning of the year, which featured sandwich-inspired apparel and limited-time offers. Last September, Arby’s unveiled We Have the Meats...for Sandwiches, a campaign designed to convey the franchise was more than a place to go for roast beef. The company wanted to build on the message and drive home "something our biggest fans already knew about Arby’s: we’re also a destination for delicious and unique sandwiches," said Jim Taylor, Arby’s CMO. Arby’s also felt the quirky, headline-grabbing campaign could help it compete with some of its rivals in the QSR industry, many of whom have larger marketing budgets. The idea for the sandwich-themed subscription box came from Arby’s ad agency partner Fallon in the spring of 2018. It was executed by Arby’s marketing and communication departments, with help from Fallon and Edelman. Originally, the plan was to launch the subscription box late last year, to align with gift-buying coverage. But the campaign was ultimately held until January, after the mad rush of the holidays and corresponding marketing noise subsided. The campaign launched in social media because the subscription box was designed to "energize core fans." Eagle-eyed consumers could purchase one of 225 subscriptions via a tweet from the company, which included a link to a microsite featuring the promotion. 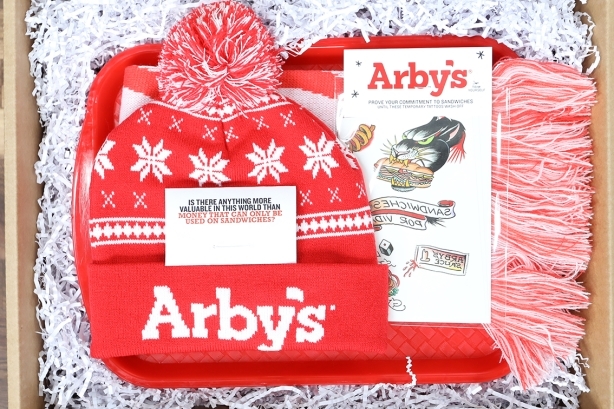 The subscription box, which featured monthly compilations of Arby’s deals and merchandise such as a bacon scarf and a selection of sandwich-based temporary tattoos, was a steal: $25 for six months. After the campaign was tweeted out, Arby’s posted about it on its Instagram channel and reached out to members of the press. The pitch to the media included a live link to the microsite, along with details about the subscription box and promotional assets. Arby’s also reserved a dozen boxes for a carefully selected group influencers who had expressed interest or engaged with the brand in the past, including ESPN’s Mike Golic, Jr., WWE Ring Announcer Mike Rome and a few popular regional radio hosts in the Atlanta area where Arby’s is based. All 250 six-month subscriptions sold out in 55 minutes, with more than 3,700 people signing up for the waitlist on ArbysoftheMonth.com. "A few of the reporters we pitched on launch day weren’t able to access the full site and ordering experience because we were entirely sold out by the time they clicked through to check it out later that day," Taylor said. In the end, however, the hiccup came with a silver-lining: multiple outlets picked up on the outsized demand, and wrote about how the subscriptions sold out in under an hour. The campaign garnered 14 earned media placements, including articles in Thrillist and Inc.
On social media, Arby’s of the Month generated 1,400 unique social mentions.